Polaris’ Titan XC is big, powerful and immeasurably fun to ride. When you visit a Polaris store you might walk past the all-new Titan thinking it’s a mountain sled as it stretches out nearly 11-feet on the showroom floor and mimics the bodywork and styling of an RMK. You’d be partially right. Titan borrows its PowderTrac running board from the RMK series and features a comfort seat with ample room for versatile Lock & Ride stowage options. JBassett photo. The 2018 Polaris 800 Titan XC 155 is BIG. 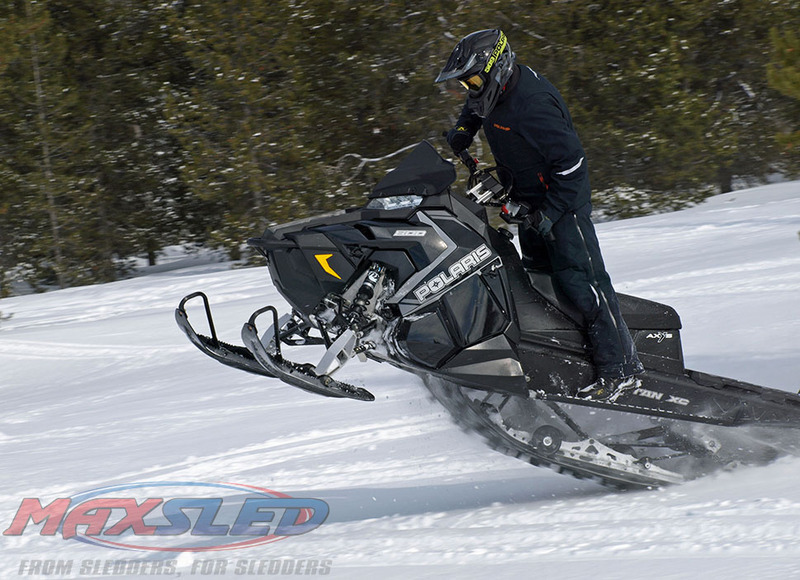 Incredibly, Polaris stylists managed to visually shrink this 155-inch tracked sled with a clever use of graphics literally expanding a bit on the Pro-RMK 155 style, embracing that sled’s length but adding some barely noticeable widening of the bodywork, windshield, seating and tunnel. On a recent visit to a local Polaris dealership we nearly tripped over a Titan, looking twice to convince ourselves that this wasn’t an RMK or stretch track Assault. It seems big, but handles smaller and can be enthusiastically ridden as it’s what Polaris claims, “a high-performance, cross-country tough sled.” JBassett photo. Giving Polaris credit for camouflaging, we must also credit Polaris engineering for creating a titanic off-trail sport (and utility?) sled that is fun to ride. 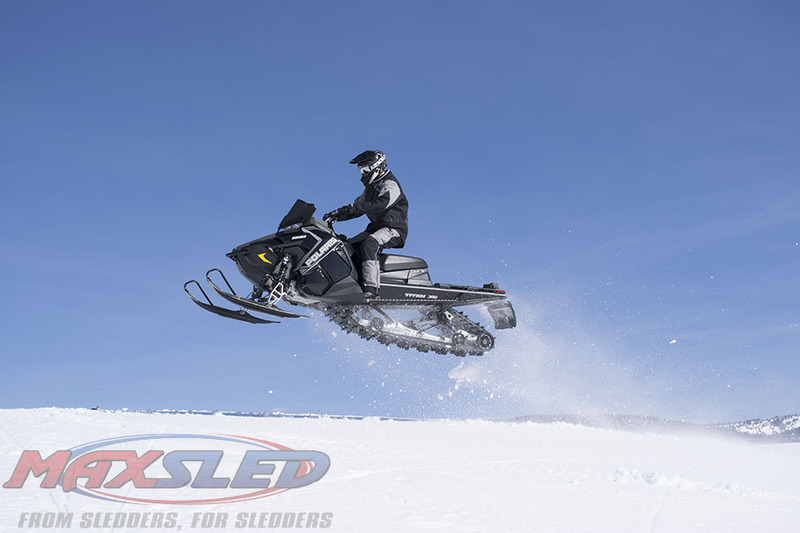 We credit Polaris marketing with that notion as the company made certain that this 600-pounder had a solo introduction to the snowmobile media in January 2017 at the Roseau, Minn., factory. Media test rode the three iterations of the Titan for parts of two quite chilling days in a wide variety of conditions. During this period Polaris marketers controlled the product optics by showcasing the all-new Titan high/low transmission that gives the sled a towing capacity of 1200-pounds; picking trails to show off the sled’s relatively easy handling and very good ride from the new articulated Titan rear suspension; and allowing drag strip style comparisons to other 800s. Up to an eighth mile, the 800 Titan’s massive 20-inch wide by 155-inch long track grips and carries its long Gripper skis off the snow. Despite our suspicions that the Titan first showed up in planning meetings looking to take advantage of what was an incredible flurry of sled sales in Russia back in 2014, Polaris claims this sled was not an answer to serving the then hot non-North America market with its 54,320 unit sales — slightly more sales at the time than those of the US at 54,028 units sold. Okay, we won’t argue the point. But the Titan XC certainly appeals to riders in non-North American markets that lack the sophisticated and extensive trail networks that we have. And it certainly appeals to performance buyers that want flotation, haul-ability and go-power. 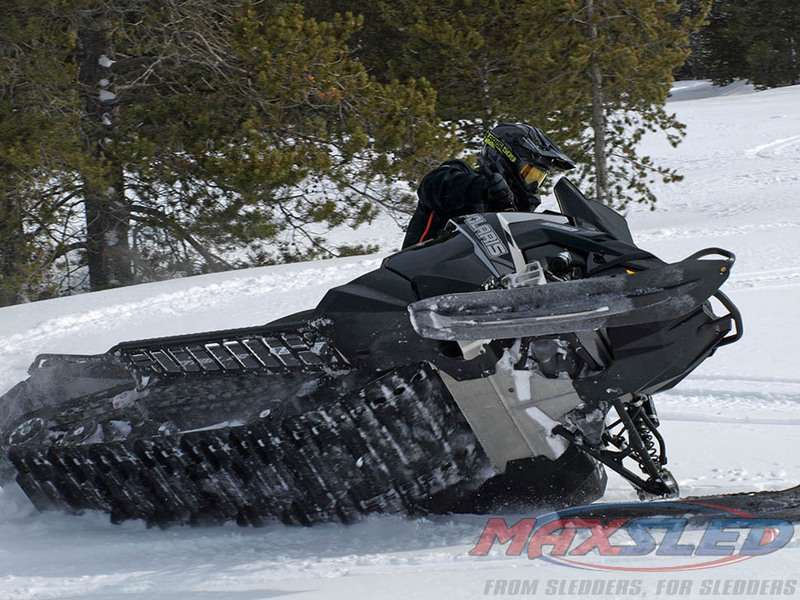 Combine an 800cc Cleanfire twin and 20×155-inch traction and you get quick-hitting, ski-lifting acceleration. JBassett photo. Of the three Titans — SP, Adventure and XC — the 800 Titan XC 155 is the high-performance edition. All three come with the RMK-type styling that fits the latest 800cc Polaris Cleanfire two-stroke twin. Under that hood is room for both the big Polaris-engineered fuel-injected twin but also its all-new Polaris TITAN Alpha transmission with high and low gear ranges as well as neutral and reverse. It’s an easy-shifting gearbox, but offers neither the synchronicity of the Ski-Doo/Lynx two-speed synchro-transmission nor the low “granny” gearing of Cat’s three-speed gearbox. 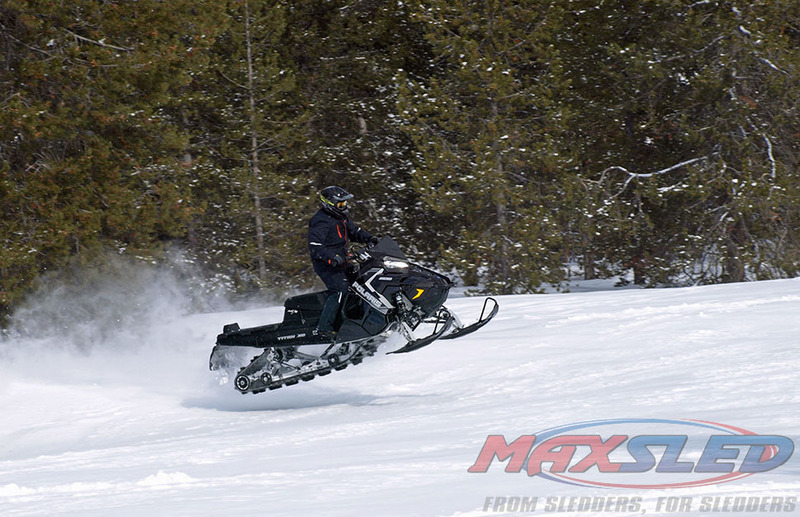 When evaluating this 600-plus pound sled, we didn’t seek out a get stuck situation whereby we could test out its low range to engage its 1.8-inch lugged 20×155-inch footprint and get unstuck. Based on our other riding both in northern Minnesota and West Yellowstone a month later we’re comfortable believing that it does as Polaris claims. On first ride impressions, we liked the XC best with its narrower Gripper skis, but upon further ride evaluation and a better understanding of the difference in skis and how they affected the Titan, we’d chose the higher flotation Pro-Float ski of the SP and Adventure. Here’s our thinking, on first sight the Pro-Float looks, frankly, wide and cumbersome compared to the XC’s Gripper ski. But, we learned that despite its appearance the Pro-Float has an under-ski design that essentially mimics the Gripper, but features surrounding plastic for better off-trail mobility. The Titan XC comes fitted with aggressive front-end grip, thanks to both its Gripper skis and the use of specially calibrated Fox QS3 adjustable shocks. JBassett photo. 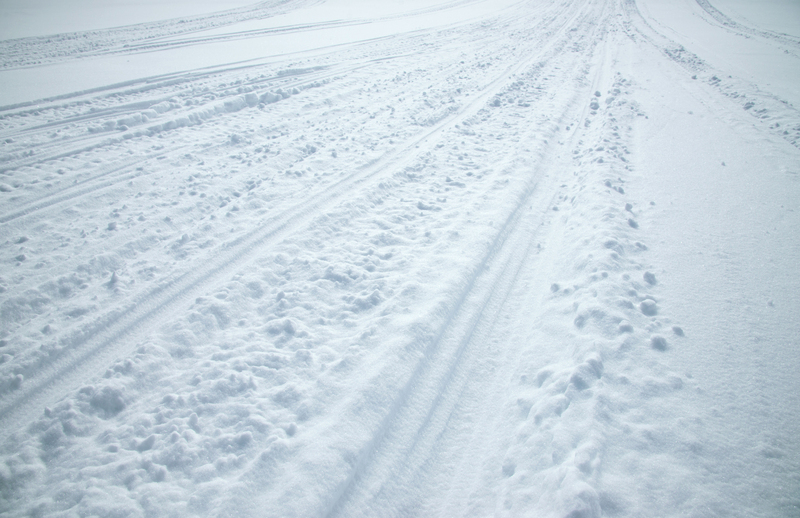 We would not recommend getting an XC and simply putting Pro-Float skis on it. The XC comes fitted with more aggressive front-end grip, thanks to both its Gripper skis and the use of specially calibrated Fox QS3 adjustable shocks. Remember the XC also has an aggressive Cobra track with 1.8-inch lug profile to make it the sportiest of the three Titans. That track rotates around a new articulated Titan rear suspension that offers more than 16-inches of rear travel, also controlled via QS3 quick adjust shocks. When you consider that Polaris lists such options as an integrated 1500-lb winch and a variety of cargo boxes and other stowage options for its versatile Lock & Ride system, the Titan’s on and off trail capabilities surprise even the most skeptical rider. An experienced rider can make the XC dance through the snow and snake through the trees like an Assault 144. We didn’t do that, but filmed it being done by one of Polaris’ Titan project engineers. 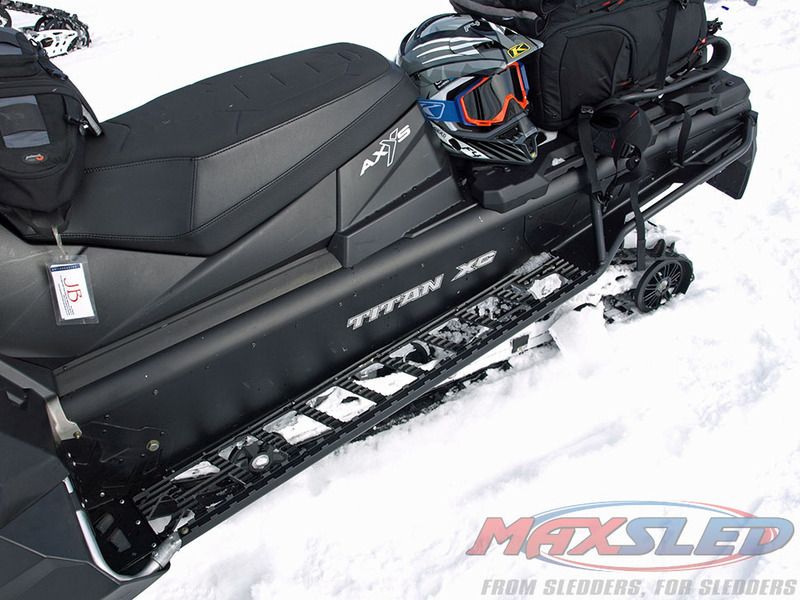 As an engineer over from the race design engineering group, this rider enthusiastically espoused the Titan as being exactly what Polaris claims, “a high-performance, cross-country tough sled.” We concur. Built round the familiar AXYS themed rider balance chassis and including an AXYS front suspension, the Titan can handle “air” and off trail adventuring as well as an Assault. JBassett photo. But, we won’t pretend this sled will be all things to all riders. You need a bit of an open mind when sizing up the new Titan. Big, yes, but in reality, actually shorter and narrower than the 800 Pro-RMK 155 and also equipped with three ski stance choices from 39 to 41-inches. With an open mind, you will appreciate the de riguer RMK-like features found in the Titan as it borrowed liberally from the RMK sled bin. There’s a Titan-specific PowderTrac running board with a secure foot position. The sled is built round the familiar AXYS themed rider balance chassis and includes an AXYS front suspension featuring RMK concepts. But exclusive to the 2018 Titan is an automotive-type power boosting regulator that Polaris says maintains maximum electrical power at low revs and will provide consistent wattage for heated seats, battery charging and a variety of options, including the new winch. 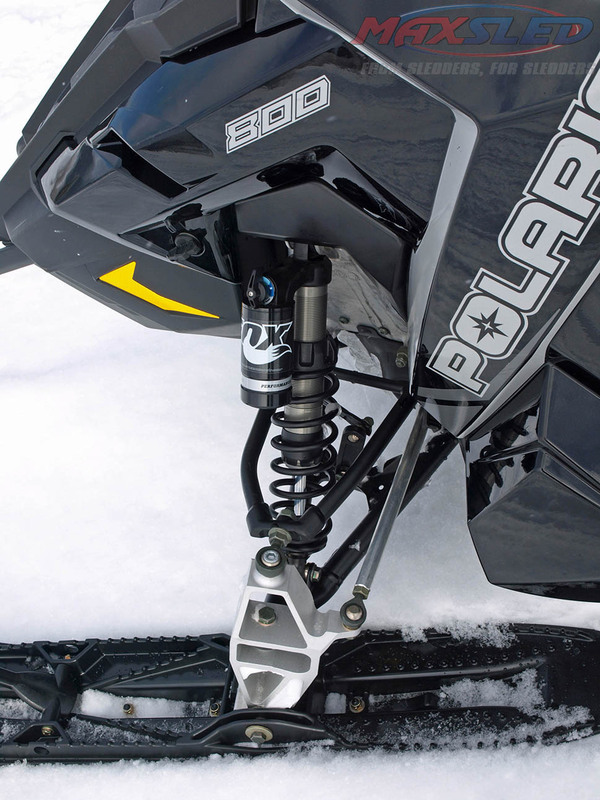 Should you encounter minimal snow conditions, Polaris designed in as standard equipment an extremely efficient cooling system that includes a radiator. Polaris claims test engineers proved the cooling capability when they needed to travel over bare fire roads to get to their snowy test area. We tested the Titan in flatland Minnesota and mile-high West Yellowstone and came away impressed. When we fully retire, we’d consider a Titan as our snowmobile version of an emergency tow truck (Max Towing? ), hooking up and towing out of the woods unwary weekend riders broken down on the trailside. While that would be our stated “business” purpose, we’d enjoy racking up hundreds of trail miles a weekend as this sled is truly a sporty giant with quick acceleration, power to churn off trail and options that make it whatever you need or want it to be. It is big, powerful and immeasurably fun to ride.